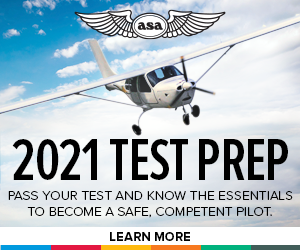 A pilot must develop the proper coordination, timing, and attention to accurately and safely maneuver the airplane with regard to the required attitudes and ground references. Ground reference maneuvers are the principle flight maneuvers that combine the four fundamentals (straight-and-level, turns, climbs, and descents) into a set of integrated skills that the pilot uses in their everyday flight activity. A pilot must develop the skills necessary to accurately control, through the effect and use of the flight controls, the flightpath of the airplane in relationship to the ground. From every takeoff to every landing, a pilot exercises these skills in controlling the airplane. Today, we’re featuring an excerpt from the Airplane Flying Handbook (FAA-H-8083-3B) on a principle ground reference maneuver known as the rectangular course. Dividing attention between the flightpath, groundbased references, manipulating the flight controls, and scanning for outside hazards and instrument indications. Adjusting the bank angle during turns to correct for groundspeed changes in order to maintain constant radius turns. Rolling out from a turn with the required wind correction angle to compensate for any drift cause by the wind. Establishing and correcting the wind correction angle in order to maintain the track over the ground. Preparing the pilot for the airport traffic pattern and subsequent landing pattern practice. First, a square, rectangular field, or an area with suitable ground references on all four sides, as previously mentioned should be selected consistent with safe practices. The airplane should be flown parallel to and at an equal distance between one-half to three-fourths of a mile away from the field boundaries or selected ground references. The flightpath should be positioned outside the field boundaries or selected ground references so that the references may be easily observed from either pilot seat. It is not practicable to fly directly above the field boundaries or selected ground references. The pilot should avoid flying close to the references, as this will require the pilot to turn using very steep bank angles, thereby increasing aerodynamic load factor and the airplane’s stall speed, especially in the downwind to crosswind turn. The entry into the maneuver should be accomplished downwind. This places the wind on the tail of the airplane and results in an increased groundspeed. There should be no wind correction angle if the wind is directly on the tail of the airplane; however, a real-world situation results in some drift correction. The turn from the downwind leg onto the base leg is entered with a relatively steep bank angle. The pilot should roll the airplane into a steep bank with rapid, but not excessive, coordinated aileron and rudder pressures. As the airplane turns onto the following base leg, the tailwind lessens and becomes a crosswind; the bank angle is reduced gradually with coordinated aileron and rudder pressures. The pilot should be prepared for the lateral drift and compensate by turning more than 90° angling toward the inside of the rectangular course. The next leg is where the airplane turns from a base leg position to the upwind leg. Ideally, the wind is directly on the nose of the airplane resulting in a direct headwind and decreased groundspeed; however, a real-world situation results in some drift correction. The pilot should roll the airplane into a medium banked turn with coordinated aileron and rudder pressures. As the airplane turns onto the upwind leg, the crosswind lessens and becomes a headwind, and the bank angle is gradually reduced with coordinated aileron and rudder pressures. Because the pilot was angled into the wind on the base leg, the turn to the upwind leg is less than 90°. The next leg is where the airplane turns from an upwind leg position to the crosswind leg. The pilot should slowly roll the airplane into a shallow-banked turn, as the developing crosswind drifts the airplane into the inside of the rectangular course with coordinated aileron and rudder pressures. As the airplane turns onto the crosswind leg, the headwind lessens and becomes a crosswind. As the turn nears completion, the bank angle is reduced with coordinated aileron and rudder pressures. 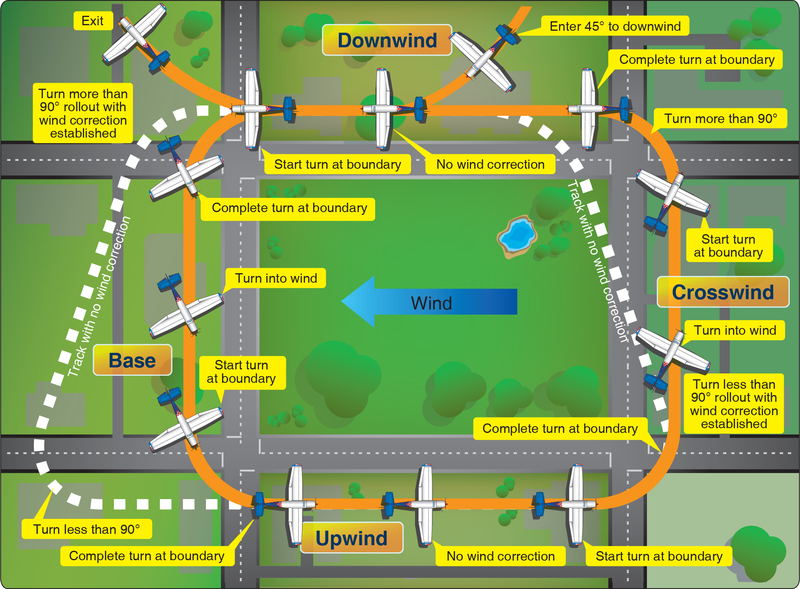 To compensate for the crosswind, the pilot must angle into the wind, toward the outside of the rectangular course, which requires the turn to be less than 90°. The final turn is back to the downwind leg, which requires a medium-banked angle and a turn greater than 90°. The groundspeed will be increasing as the turn progresses and the bank should be held and then rolled out in a rapid, but not excessive, manner using coordinated aileron and rudder pressures. For the maneuver to be executed properly, the pilot must visually utilize the ground-based, nose, and wingtip references to properly position the airplane in attitude and in orientation to the rectangular course. Each turn, in order to maintain a constant ground-based radius, requires the bank angle to be adjusted to compensate for the changing groundspeed—the higher the groundspeed, the steeper the bank. If the groundspeed is initially higher and then decreases throughout the turn, the bank angle should progressively decrease throughout the turn. The converse is also true, if the groundspeed is initially slower and then increases throughout the turn, the bank angle should progressively increase throughout the turn until rollout is started. Also, the rate for rolling in and out of the turn should be adjusted to prevent drifting in or out of the course. When the wind is from a direction that could drift the airplane into the course, the banking roll rate should be slow. When the wind is from a direction that could drift the airplane to the outside of the course, the banking roll rate should be quick. Failure to apply coordinated aileron and rudder pressure, resulting in slips and skids. Failure to properly divide attention between controlling the airplane and maintaining proper orientation with the ground references. Failure to execute turns with accurate timing.